"Fortunately America had a figure of rocklike calm -- a kind of super­man, a term that he was not embarrassed to apply to himself in private correspondence -- to whom it could turn in times of crisis such as [the Mississippi flood of 1927]. His name was Herbert Hoover. Soon he would be the most derided presi­dent of his time -- quite an achievement for someone elected in the same decade as Warren G. Harding -- but in the spring of 1927 he was, and by a very wide margin, the world's most trusted man. He was also, curiously, perhaps the least likable hero America has ever produced. The summer of 1927 would make him a little more of both. 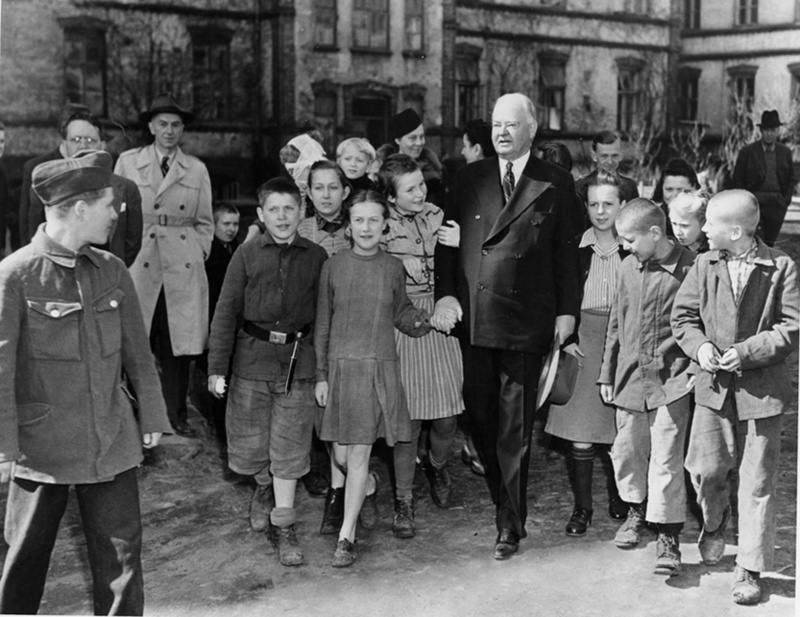 "Though he never finished high school -- his uncle, disregarding his brightness, sent him to work as an office boy in Salem, Oregon, instead­ -- Hoover nurtured a fierce ambition to better himself. In 1891, at age sev­enteen, he passed the entrance examinations for the brand-new Leland Stanford Junior University (or just Stanford as we now know it), which then was a free school. As a member of Stanford's first-ever class, he studied geology and also met there his future wife, Lou Henry, who by chance was also from Iowa. (They would marry in 1899.) Upon graduat­ing, Hoover took the only job he could find, in a gold mine in Nevada City, California, loading and pushing an ore cart ten hours a day seven days a week for 20 cents an hour -- a meager salary even then. That this was the permanent lot for his fellow miners seems never to have troubled him. Hoover was a great believer in -- and a living embodiment of -- the notion of personal responsibility. "He would very probably have passed his life in wealthy anonymity but for a sudden change in circumstances that thrust him unexpectedly into the limelight. When war broke out in 1914, Hoover, as a prominent American, was called on to help evacuate other Americans stranded in Europe -- there were, remarkably, over 120,000 of them -- and he per­formed that duty with such efficiency and distinction that he was asked to take on the much greater challenge of heading the new Commission for Relief in Belgium. "Belgium was overwhelmed by war, its farms destroyed, its factories shut, its foodstocks seized by the Germans. Eight million Belgians were in real peril of starving. 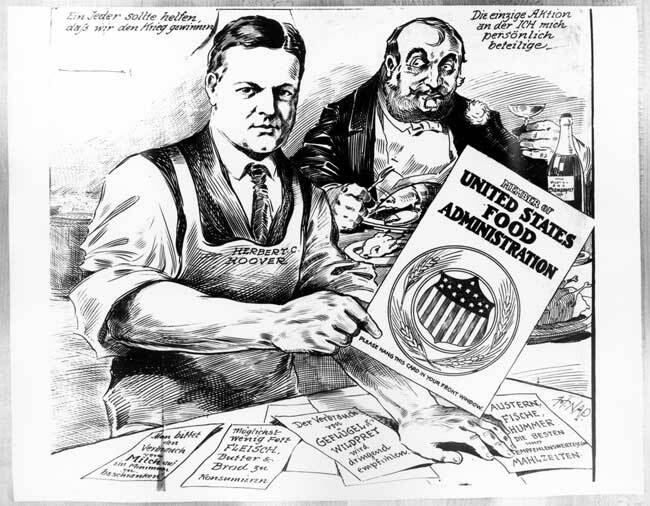 Hoover managed to find and distribute $1.8 million worth of food a week, every week, for two and a half years -- 2.5 million tons of it altogether -- and to deliver it to people who would otherwise have gone unfed. The achievement can hardly be overstated. It was the greatest relief effort ever undertaken on earth, and it made him, deserv­edly, an international hero. By 1917, it was reckoned that Hoover had saved more lives than any other person in history. One enthusiast called him 'the greatest humanitarian since Jesus Christ,' which of course is about as generous as a compliment can get. The label stuck. He became to the world the Great Humanitarian. "Two things accounted for Hoover's glorious reputation: he executed his duties with tireless efficiency and dispatch, and he made sure that no one anywhere was ever unaware of his accomplishments. Myron Her­rick, America's avuncular ambassador in Paris, performed similar heroic feats in occupied France without receiving any thanks from posterity, but only because he didn't seek them. Hoover by contrast was meticu­lous in ensuring that every positive act associated with him was inflated to maximum importance and covered with a press release."